The DreamLine Flex pivot shower enclosure and SlimLine base kit offers modern appeal at a budget friendly price point. The versatile Flex model combines cutting-edge pivot hardware, simple installation and dependable performance. Complete your bathroom with the elegant and innovative look of the Flex shower enclosure and SlimLine base kit from DreamLine for the complete solution for your shower project. The DreamLine SlimLine double threshold shower floor may be used in a custom shower project or combined with a DreamLine Shower Enclosure for a complete shower installation or tub-to-shower replacement project. The modern shower bases have a low profile design for a clean polished look. DreamLine shower bases deliver a smart alternative to the time and cost involved with custom tile, with a product that is easy-to-install and an excellent value. Made of attractive high gloss Acrylic/ABS materials, the bases are fibreglass reinforced for durability. Each double threshold shower base comes standard with a slip-resistant textured floor pattern, 2-side integrated tile flanges and an opening ready for a standard compression fitting drain. DreamLine offers a collection of cUPC certified low profile shower bases. These shower trays are cUPC certified, which affirms they are in compliance with applicable American and Canadian codes and standards. Compliment your bathtub, shower, or shower base with a Mirolin shower door. These doors are available in a variety of sizes and styles and are sure to meet your design application needs. SlimLine 34-inch x 60-inch Single Threshold Shower Base in Biscuit with Right Hand Drain The DreamLine SlimLine shower bases showcase premium high-gloss acrylic, reinforced with fiberglass for durability and a modern, low profile design. SlipGrip textured floor surface offers slip resistance for safety. Glossy acrylic finish safeguards against stains for easy maintenance. DreamLine SlimLine shower bases are available in multiple colors and are sure to complement your bathroom style! 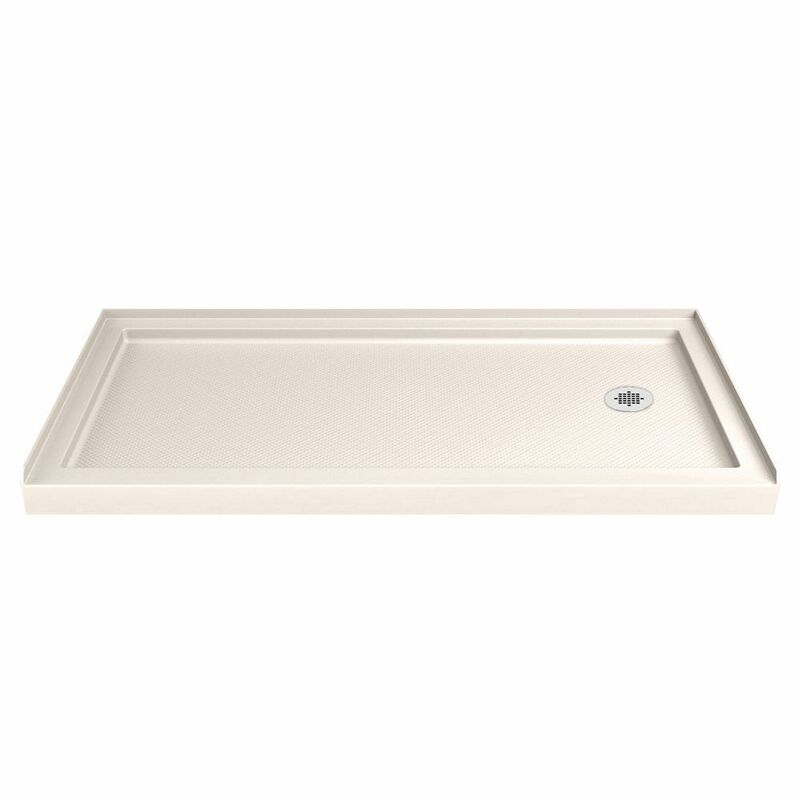 SlimLine 34-inch x 60-inch Single Threshold Shower Base in Biscuit with Right Hand Drain is rated 4.7 out of 5 by 3. Rated 5 out of 5 by Allen from Great shower base I bought this base for a tub to shower conversion. The contractor had no issues with the base installation, and so far it has functioned very well. This was installed on a slab, and the contractor filled the void under the base with with concrete to insure stability. The texture improves stability, and the low threshold is great. It has only been installed for a few months, and I hope it will last for many years.